Spring is finally arriving!!! 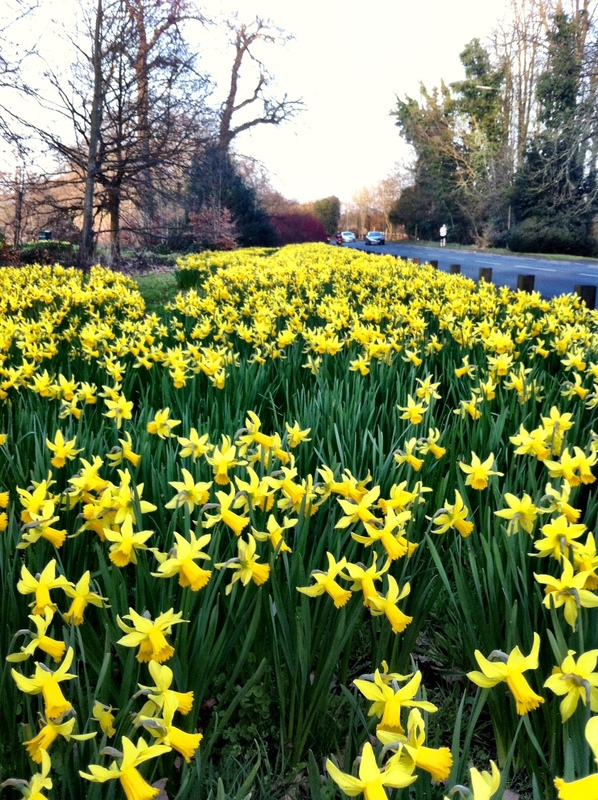 I took my friend's daughter for a walk after lunch and we stumbled upon lots of lots of daffodils. If there’s one thing I love more than spending my weekends cooking, it’s spending my weekends cooking for friends. I get an obscene, almost indecent, amount of pleasure from it, and nothing pleases me more than having my closest friends around the table laughing, talking, drinking and eating together. Naturally, I use them as guinea pigs to try my recipes out on but I’ve realised that it’s a bit of a silly thing to do because they would probably say they loved my food even if I was serving them cardboard. I’ve learnt the hard way that when cooking for friends, it’s best to find recipes that one can 1) prepare in advance; and 2) bung into the oven – so that one can spend as little time in the kitchen as possible. 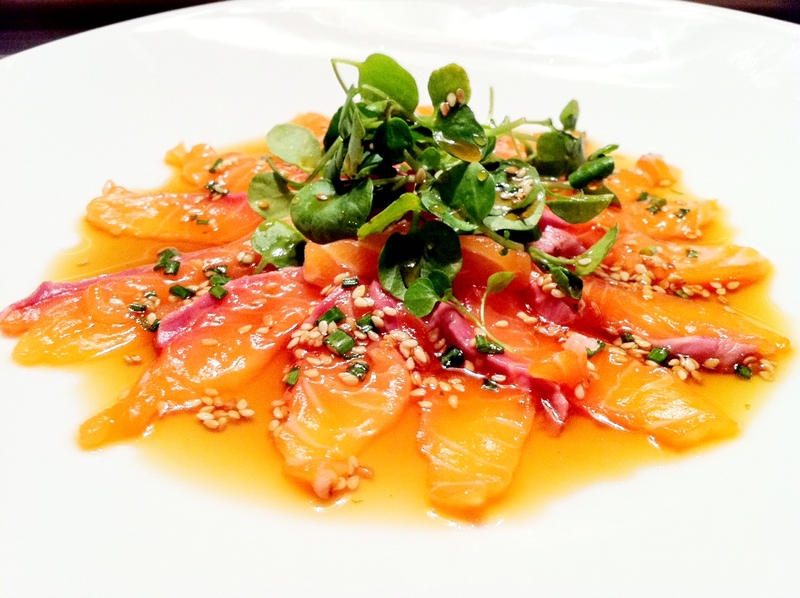 While my friends love that we always try to serve tasty food, they love our company more. I created this dish last Sunday when our friends came over. It’s so easy to make and perfect for when you’re cooking for lots of people. 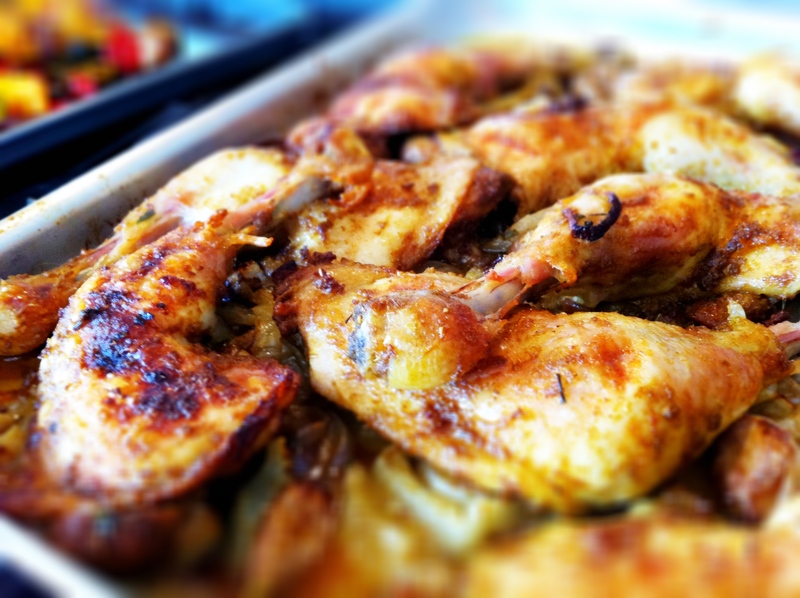 It’s even something I think my husband’s family would eat (not all of them can handle the amount of spice my husband and I can) because this roasted lemongrass and curry-flavoured baked chicken is full of spice and flavour but ‘heat’ free – another important factor since my friend’s children can’t handle spicy food yet either. Kris over at Kris Cooks inspired me to use lemongrass as they’ve just used it in a grilled chicken recipe. I’ve made a completely different dish but I love being inspired by other blogs as they remind me of different ingredients I should try and use more of – thanks Kris! Same dish - but I made a super-sized sharing platter today. I thought I’d list our Sunday lunch menu for you plus I also thought you might find it easy knowing the schedule for cooking as this whole meal (not counting the pre-preparation involved) takes no more than an hour. Main (marinated the chicken the night before) – Lemongrass and curry-flavoured chicken, roasted on a bed of onions, shallots, fennel and garlic. I served this with some cardamom-coconut rice, and roasted vegetables. 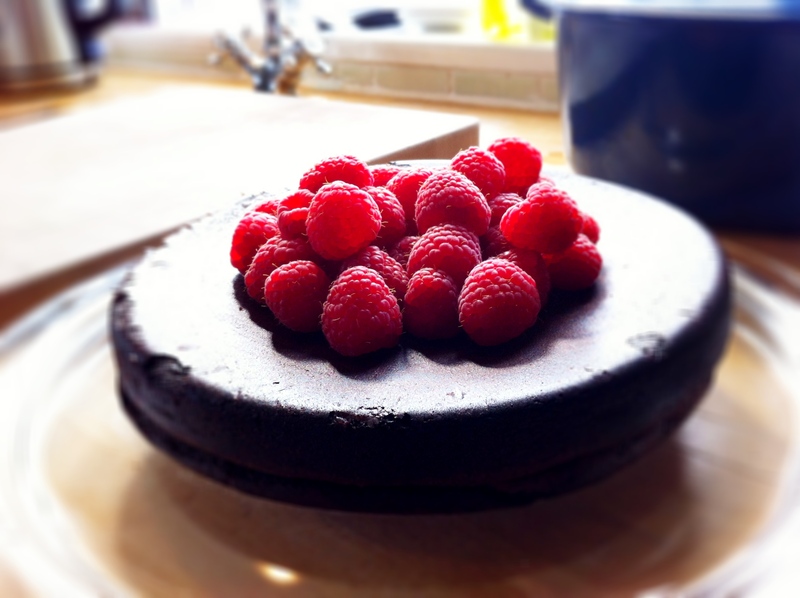 I also made a flour-less chocolate cake to share, which I'll post next week. 1.30pm: Turned oven down to 180 degrees (celsius) Removed silver foil from chicken, and also put vegetables into the oven to roast. Also set my rice cooker going to cook the cardamom-coconut rice. 2.00pm: Basted the chicken again and gave the vegetables another stir, returned both to the oven again. 2.10pm: Removed both the chicken and roasted veg. While these were resting, I dished up my cardamom-coconut rice and then simply grabbed the chicken and roasted veg and started serving. Easy. 90% of this three course meal was prepared in advance and, I kid you not, I spent no more than 10 minutes in the kitchen throughout the cooking and serving process on the day, leaving me with the maximum amount of time to spend with my friends. 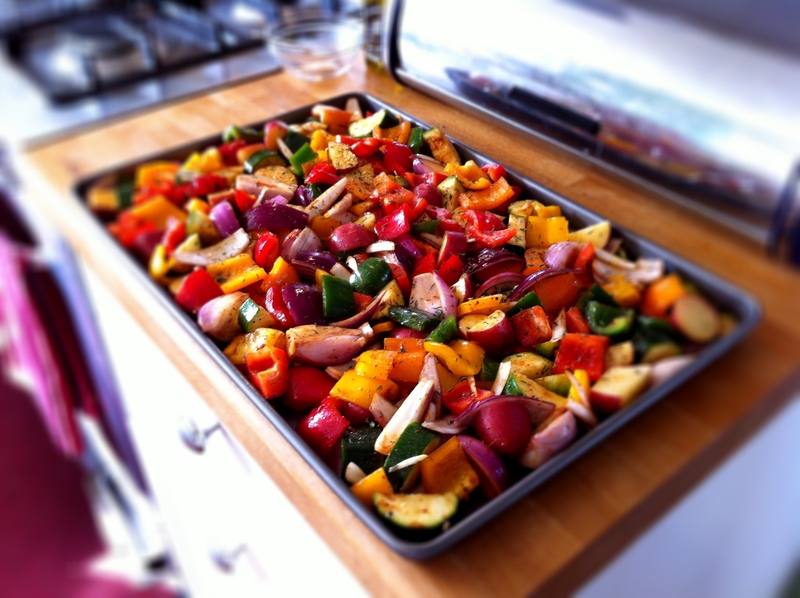 Roasted courgettes, shallots, thyme, onions and mixed peppers in chilli powder, smoked paprika and olive oil. Allow your chicken to marinate overnight and then place them on your bed of vegetables before you bung everything into the oven. Turn the chicken over skin-side up, give the tray another shake (you’ll find the fennel and onions start to release their juices and mix with the marinade to create a lovely smelling sauce. Return to the oven for another 10-15 minutes. 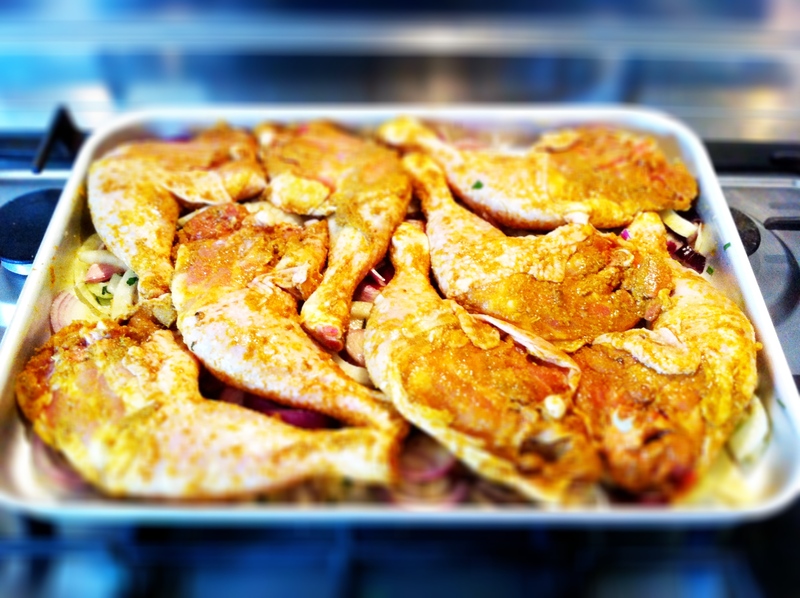 Lemongrass and curry-flavoured chicken, roasted in the oven with fennel, onions, shallots and garlic. Minimum effort, maximum taste! What a great meal to serve and your prep work really did pay off! I need to borrow a page or 2 from your manual for I spend too much time in the kitchen and not enough with my friends. Your wonderful meal here proves that it doesn’t need to be that way a all. The chicken looks delicious, but I’m excited to see your flourless chocolate cake next week! Everything about this looks amazing – I’m looking for new ways to prepare some chicken, so this is right on time! I’m also definitely curious for the flourless chocolate cake! Ummmm can I come over for dinner??? This looks amazing! Lucky friends BFN, I would surely be happy if you were to serve me that meal. I never thought of using lemon grass in a rub as you did, but I do love the idea. Thanks for the inspiration. I want a piece of that chicken – YUM:) Have a Great Weekend! Lemongrass chicken i s one of my favorite things. Roasted fennel is another one. And it is a good thing I can’t get at that flourless chocolate cake with the raspberries. I’m like you…I like to prepare as much in advance as possible when having friends over. This looks like an amazing meal and I love the combo of ingredients and flavors in this chicken. Great job and I bet your friends were thrilled with the meal. Also, have you shared the recipe for the rice yet? It sounds good too.